The NDEx Project | Interactive Networks viewer – Phase 1 complete! Interactive Networks viewer – Phase 1 complete! 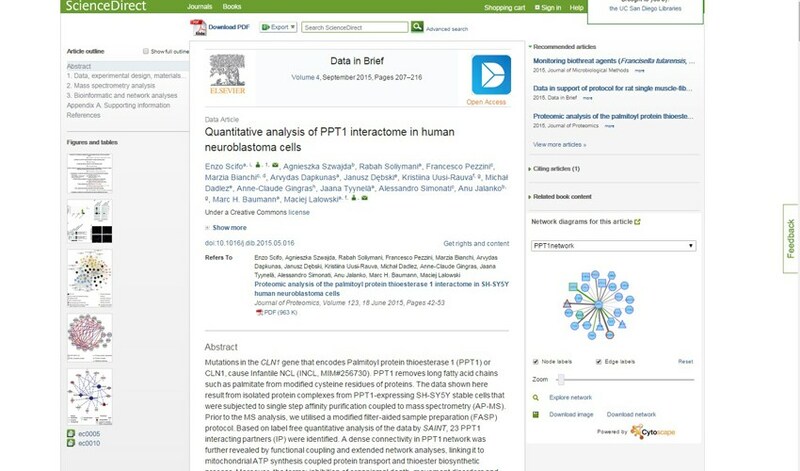 Elsevier and Cytoscape have joined forces to create a networks viewer that allows authors to publish fully interactive network diagrams as part of their articles on ScienceDirect.com. Detailed instructions for authors and links to publications that use this new feature are available here. As of phase 1, the interactive viewer allows some basic actions like moving nodes and edges, showing/hiding labels, zooming and panning. Future rounds of development will include the possibility to customize the network layout and, most importantly, full integration with NDEx!!! Users will be able to seamlessly save networks to their NDEx account (or create one if they don't have it already) and then run queries, save and export subnetworks of interest and share their work with collaborators. Stay tuned for more news about the Interactive Networks Viewer: subscribe to our mailing list and follow the NDEx Project on LinkedIn!